Whenever movie mayhem comes under attack from concerned citizens – as it did after the Sandy Hook shootings in 2012 – filmmakers often justify their work by claiming that their depictions of violence are not endorsements. It’s hard to take that seriously, especially because they usually make gun play look so cool and leave out the grisly, awful details. Blue Ruin is designed to avoid that trap. The tense and bloody revenge thriller from Brooklyn-based director Jeremy Saulnier is a violent film in its own right, but it can also be read as clever response to those films that sensationalize violence, adding realism to a genre that has been ruled for too long by escapism. When we first meet Dwight (Macon Blair), he doesn’t seem like the violent type. Living out of his car and collecting bottles for a living, Dwight only wants to be left alone. But after his parents’ murderer is released from prison, he sets off with a single-minded purpose to avenge their death. The initial conflict is quickly resolved, but he unwittingly ignites a war between the murderer’s family and his own – his sister and her kids are the only people he claims to care about – and Dwight must quickly learn to do all those things – fight and kill, namely – that revenge movies have glorified for years. Saulnier imbues the film with a gritty, minimalist aesthetic that is both a product of the film’s micro-budget and an effective tool for making the audience feel the impact of its violence. There are no movie stars to be found here; in fact, nothing onscreen is attractive in any conventional sense, and Saulnier uses no camera tricks or special effects. Instead, he lets his actors fumble their way through the action sequences and keeps his directorial eye trained on their emotional reactions, not the balletic, tightly choreographed fight scenes that most action movies proudly display. But the character of Dwight is also crucial. He is not a Liam Neeson-type who has been trained to kill with his bare hands. Characters like that inevitably make violence look satisfying and fun, but Dwight is a novice, and his clumsy actions clearly show the physical and emotional consequences of revenge. As the amateur assassin, Blair gives an effectively minimalist performance. His hangdog face efficiently conveys a lingering inner sadness, and his awkward physicality with guns and violence makes him easy to relate to. When he is pointing a gun at someone – as he does often in Blue Ruin – it looks like it is the last place he wants to be. Saulnier otherwise populates the film with a cast of naturalistic actors. Nearly every character is accustomed to some kind of violence – its hardened, rural backwoods setting recalls that of HBO’s True Detective – and the characters are simple-minded, straight-talking folk. None of them have much screen time besides Blair, but they create an authentic world, and their untimely ends feel consequential as a result. The violence that inevitably occurs is often graphic and difficult to watch. But that’s the point. After Dwight experiences shock at a bullet wound, a colleague tells him, “That’s what bullets do,” tacitly revealing the falsities of film. When a friend is giving him advice before the film’s potentially bloody climax, he warns him not to make any big speeches before he shoots (like they do in the movies, presumably). Saulnier peppers these comments on film violence throughout the script to make sure we get the point. You probably have figured out by now that Blue Ruin is not a film you will enjoy exactly (and it’s certainly not one for the kiddies). But it is an effectively tense thriller that earns a comparison to the best films that are thoughtful about their violence. Some have compared Saulnier’s film to the work of the Coen brothers (Fargo, No Country for Old Men), and it’s easy to see the similarities. They both depict violent worlds in which ordinary men often lose themselves, and they often find ways to comment on that violence, instead of glorifying it. But even the Coens still hide the final brutality of their bloodshed behind their quirky style. 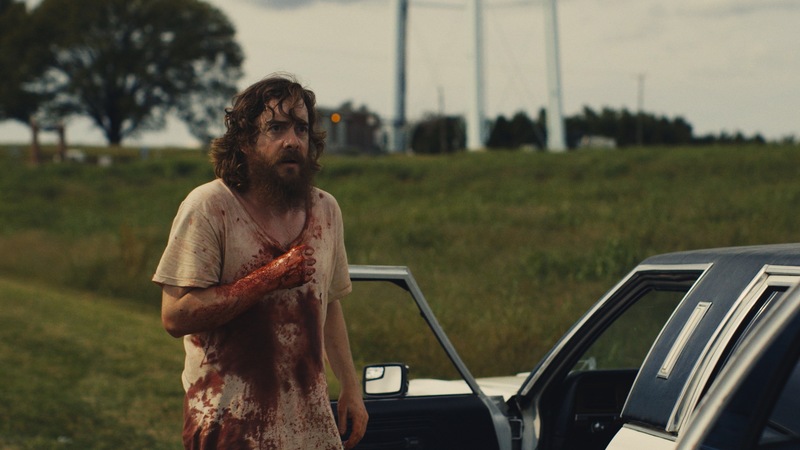 Blue Ruin tends towards naturalism so that the true impact of its events is never lost on the characters – or the audience. “Blue Ruin” is currently in theaters and available on VOD. Jim Carrey’s Latest Move: Weird, Brave, or Both?